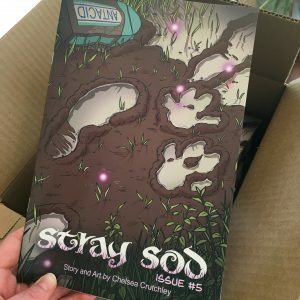 Stray Sod » Issue #5 Finishing Up! As you might be able to guess, it’s been a busy month. 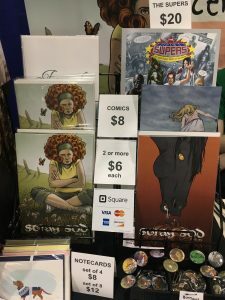 The Calgary Expo was fantastic this year, the most obvious indication of that being that Issue #2 sold out on Saturday. Sadly, on Sunday I got a migraine and missed the last day. My incredible booth mate rearranged her schedule to take over, running both my side and hers, Boon Ceramics. After that, it was pedal to the medal to get Issue #5 done for the Panel One Comic Creator Festival. To expedite things, I did all the penciling and inking of the last pages at once, then colored them, so I had no pages to post here. It took quite an effort and a lot of lost sleep, and my shoulders and neck were killing me by the end, but the pages got to the printer in time. It was a very rewarding feeling indeed. Issue #5 books will be available to purchase online once I set up the new shop. Big Cartel has been a great place to start, but it limits you to five items on its free program, and I honestly don’t earn enough in online comic sales to justify upgrading. So it’s time for a new store front where I can sell more items at the lowest possible monthly fee. And now, the final pages of the issue are queued up for you to enjoy for the next several weeks! What about Issue #6, you might wonder? I’m at a weird point right now, where I can’t really go forwards until I go backwards. The next couple of issues are fully scripted and ready to go. But physical copies of Stray Sod are running low, and it seems silly to reprint them until some minor edits are made. I’d also like to make the issues available digitally, and get this story in front of more eyes. So before I delve into Issue #6 with renewed vigor, this other stuff needs to be taken care of. I’m still considering an exact date to launch Issue #6, but you can keep abreast of things on social media, or check back here for further news updates. 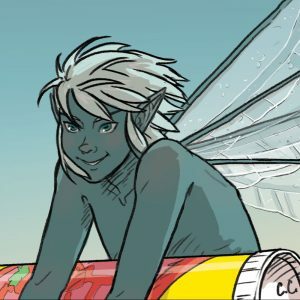 Enjoy these next pages!